S ome signs of foundation damage are subtle, like sticking windows or an uneven floor. On the other hand, you have warning signs like a leaning chimney. That sign is pretty obvious and dangerous. Contact the leaning chimney experts at Tar Heel Foundation Solutions immediately, if you are dealing with a tilting chimney. A leaning or tilting chimney can be a hazard to people and property. 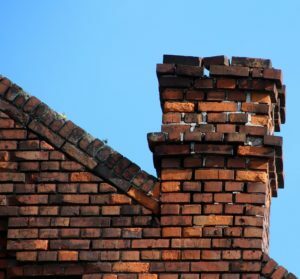 Depending on the direction that the chimney is leaning, it could fall back on your home, causing damage to the roof or come through the ceiling. If it is leaning away from your home, bricks could fall, hitting someone or damaging vehicles or property. Another problem that can occur from a tilting chimney is a pest infestation. Insects and small animals can enter your home through gaps between the chimney and the wall. Water can also enter your home. If it’s inside walls, it may not be noticed until it damages wiring or causes structural problems. If you see that your chimney is tilting or pulling away from your home, you need to have your home inspected immediately. You can look for cracks, water leaks, or musty odors from your basement or crawl space. A leaning chimney is not something that you can repair yourself. You need an expert repair professional like those at Tar Heel Foundation Solutions to come fix your chimney and protect you and your neighbors from injury and property damage. Just like most home repair problems, there is more than one cause behind a leaning chimney. The footing may be too small, falling apart, or too shallow. The problem may also be in the soil. If it is expanding and contracting a lot, it can weaken the support of the chimney. If the foundation of your home is damaged or settling unevenly, your chimney may be getting left behind as your foundation shifts. This is why a leaning chimney can be a sign of foundation damage. Fortunately, Tar Heel Foundation Solutions has the answer for your chimney problems. Our foundation professionals will inspect your chimney and determine the best method to repair the damage and keep it from happening again. One of the more popular and effective methods of repairing a leaning chimney is through the use of helical piers from Earth Contact Products. 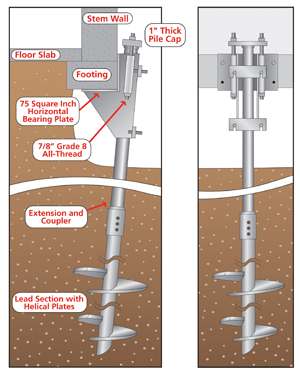 These helical piers have been proven to provide strength and support to your chimney. Don’t waste any time contacting us for help with your tilted chimney. A seemingly small problem can hide a larger problem. It can also quickly become a serious and dangerous problem. Contact us today to schedule a free inspection and quote on your leaning chimney.